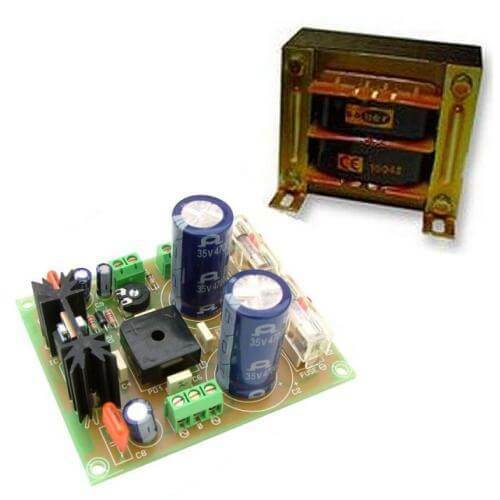 Dual polarity ±28Vdc, 3 Amp stabilised power supply module complete with a 230Vac mains chassis transformer. A secondary output provides an adjustable 18Vdc, 150mA. The module provides a stabilised output with short circuit protection, LED indicators, onboard fuses and screw terminal blocks for connections. The module is supplied fully assembled. All you need to do is house it in a suitable enclosure with the supplied chassis transformer, add the wiring and an on/off switch. Ideal for powering many projects. Continuous output current 3 Amp max. Secondary output current 150 mA max.